Volunteers carried the day as LDS Church reached a new high by keeping a lower profile. Tribune file photo The Salt Lake City Olympics were like "a coming-out party for Mormons," says Hank Stuever, who covered the Games as a feature writer for The Washington Post, "that gave people a vernacular about Mormonism they didn't have before, and that [interest] has sustained itself in pop culture." 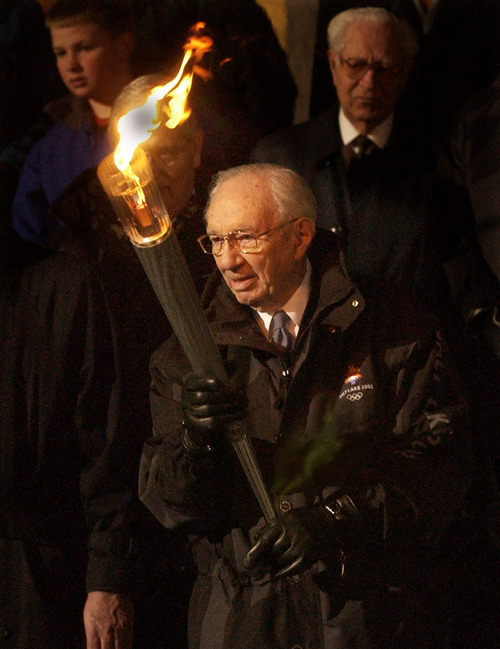 Tribune file photo LDS Church President Gordon B. Hinckley holds the Olympic torch before passing it on to apostle Neal A. Maxwell, at the Church Administration Building, at the start of the 2002 Salt Lake Olympics. Tribune file photo Dancers rehearse "Light of the World, the Mormon church's theatrical offering during the 2002 Salt Lake Olympics. 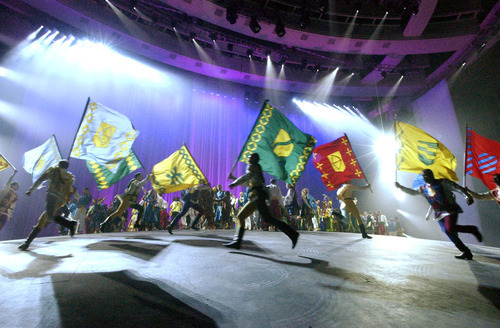 Tribune file photo Performers rehearse "Light of the World, the Mormon church's theatrical offering during the 2002 Salt Lake Olympics. 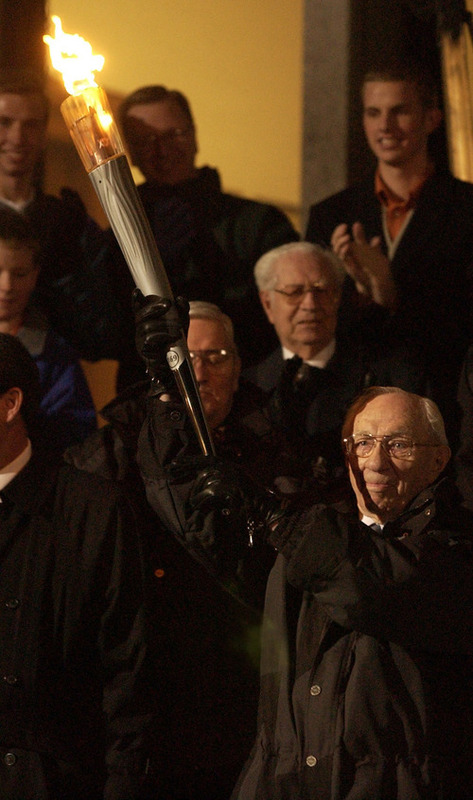 Tribune file photo LDS Church President Gordon B. Hinckley holds the Olympic torch before passing it on to apostle Neal A. Maxwell, at the Church Administration Building, at the start of the 2002 Salt Lake Olympics. 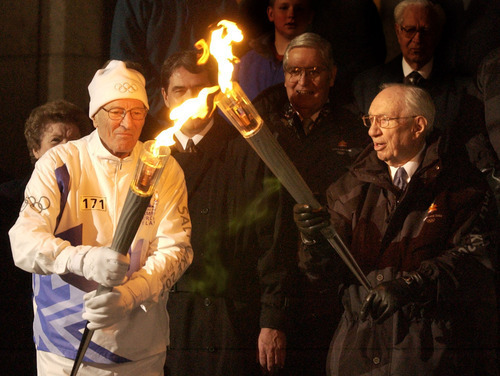 Mormon apostle Neal A. Maxwell lights his torch from the one held by LDS Church President Gordon B. Hinckley during the start of the 2002 Salt Lake Olympics. 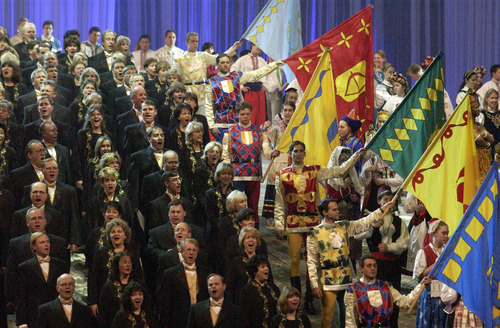 The Mormon Tabernacle Choir sings alongside costumed dancers at a rehearsal of "Light of the World," the Mormon church's theatrical offering during the 2002 Salt Lake Olympics. Before California's Prop 8, HBO's "Big Love," "American Idol" David Archuleta, two presidential candidates and "The Book of Mormon" musical, there was the first "Mormon moment" ­­ the 2002 Winter Games. The Salt Lake City Olympics were like "a coming-out party for Mormons," says Hank Stuever, who covered the Games as a feature writer for The Washington Post, "that gave people a vernacular about Mormonism they didn't have before, and that [interest] has sustained itself in pop culture." Before the first torch was lighted, many from around the globe feared that the international sporting event, dubbed the "Mormon Olympics," would be dominated by boozeless parties, name-tag-wearing missionaries in dark suits and sappy Osmond-like tunes accompanied by lame choreography during the Opening Ceremony. Some imagined they would find gingham-dressed Mormons handing out literature on street corners, extolling the joys of polygamy. Others thought the LDS hierarchy would be a smothering presence, using the occasion to promote the faith at every venue. What most participants and observers found instead during those 17 memorable days was an absence of Mormon missionaries, a surprisingly urbane and diverse city, free-flowing beer, breathtaking views and venues and at least one wet T-shirt contest. "I remember being in that public area by the Medals Plaza, encountering break dancing on the street," recalls National Public Radio's Howard Berkes, who is headquartered in Utah and has covered seven Olympics. "I haven't seen that in Utah before [the 2002 Games] or since." Plus, Mormon leaders sent out the edict that there would be no proselytizing, no pamphleteering, no handing out copies of the Book of Mormon away from, say, Temple Square. LDS volunteers were trained in how not to share their faith. Riffing off the Games' "Light the Fire Within" theme, Salt Lake Tribune columnist Robert Kirby described the LDS Church's strategy as "contain the fire within." The Salt Lake City Games also provided an infinitely patient and unfailingly polite volunteer corps, many of whom were former Mormon missionaries speaking multiple languages and all of whom eagerly responded to requests for help. "I talked to a lot of reporters after the Games," Berkes says, "and not a single one of them said it felt like a Mormon Olympics." Make no mistake, though, Mormon fingerprints were all over the Games  from the shot of the Salt Lake LDS Temple as a permanent television backdrop to the giant skater banner draped over the Church Office Building, from comments about the half-pipe competition by then-91-year-old church President Gordon B. Hinckley to the self-deprecating collector pins depicting green Jell-O and multiple wives. Prominent Mormon businessman Mitt Romney took charge after a bribery scandal, which gave the future Massachusetts governor and presidential candidate  and his church  a place on the world stage. Wrote Stuever back then: "The Mormon Tabernacle Choir shared top billing with the celebrities; Temple Square got almost as much TV time as Bob Costas. The very theme of the Games  'Light the Fire Within'  is straight out of a more self-determined, Oprah-affirmative modern Mormon theology." For the Utah-based faith, the Games' success in the aftermath of the Sept. 11 terrorist attacks were a triumphant moment  made all the sweeter by the religion's downplayed role. Coming to Zion • The LDS Church saw the Olympics as an opportunity and a threat, says NPR's Berkes, a chance to explain itself  and some of its history and beliefs  to the world's press but without power to control the message. Either way, the world was coming and the church planned to take advantage. 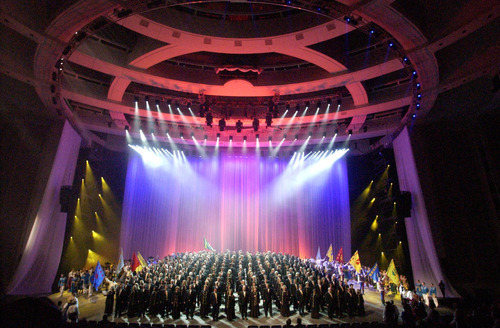 It offered extensive and high-tech media services in its own press center in downtown Salt Lake City and produced a nightly show, "Light of the World," in the giant Conference Center that offered a mix of Mormon beliefs and cultural music and dances (though few published accounts of the Games mentioned it). The church orchestrated a public-relations blitz that included distributing miniature faux leather briefcases, with the LDS Olympic logo, to visiting journalists. It provided a list of "great story ideas about Mormonism" and essays about the church's welfare and humanitarian projects, its health code and its missionary programs. It also handed out "Glimpses of Utah" calendars, wrote Jan Shipps in a 2002 issue of Religion in the News, "in which nine of the 15 images and well over half the accompanying text dealt with Mormon themes." Those efforts apparently paid off. Michael Otterson, who became the church's primary spokesman during the Games, told Shipps that "an overwhelming majority  perhaps 95 percent  of the stories featuring Mormonism and/or the LDS Church were either 'positive or fair.' "
Berkes believes the early criticism of the church helped it prepare for the coming media onslaught. "The church really benefited by being ready to respond to whatever reporters would throw at them, and they were able to positively affect the kinds of stories written," Berkes says. "It would have been far worse if the church had behaved the way it typically did [in the past], having a bunker mentality and not being available or open." Candy Thomson, a Baltimore Sun reporter who had covered numerous Olympics, came to Utah before the Games and found herself on a "Utah Media Tour" taking reporters to the venues, but which turned out to be a Mormon bus that went only to LDS businesses. As soon as she realized that, she bailed at the next stop. To the church's credit, she says now, "it didn't happen again." Thomson was familiar with Mormonism and had been to Utah frequently to hike and camp, so she wondered how her "German and Italian friends who like to drink and party would find the [Utah] locals and vice versa." But she didn't worry about how Utahns, many of whom had served international Mormon missions, would deal with foreigners. And the Salt Lake City Olympics' welcoming hospitality proved her right. In the aftermath • Before the Games, LDS media officials received more than 2,000 phone calls as reporters from across the globe scrambled to produce at least one "Mormon" story, Bruce Olsen, then director of LDS public affairs, said a month after the Olympics. During the competitions, Olsen noted, the LDS Church registered 1,324 accredited reporters at its media center. The church was mentioned in about 100 stories a day in Germany alone. The most frequent topic was the Mormon Tabernacle Choir, followed by the church's genealogy program, Olsen said. Besides writing about the Family History Library, about 200 journalists asked the church "to do their genealogy for them." Others looked into the church's welfare and humanitarian services and its female missionaries at Temple Square. 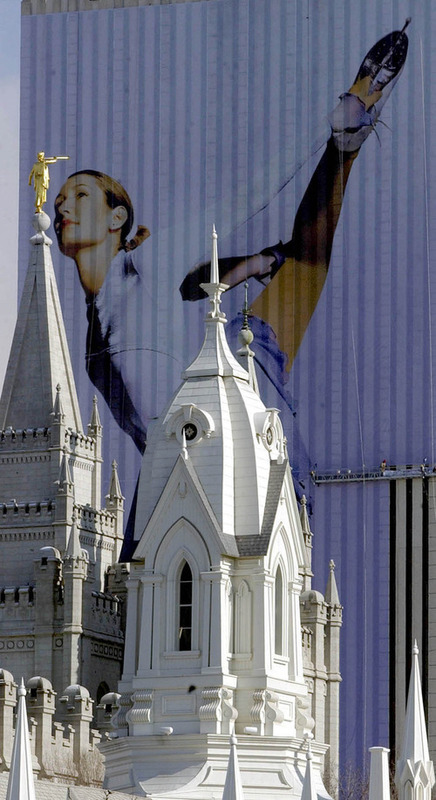 Many reported the church's decision not to proselytize in Salt Lake City during the Games and Mormons' need for acceptance and understanding, he said. A few took up questions about polygamy (which the faith hasn't practiced for more than a century), gay marriage, even LDS humor. The Post's Stuever poked affectionate fun at Salt Lake City as the "capital of nice," a place "where nice is being slathered on top of nice, and the result is the nicest ever." He described the LDS Church's film about the Book of Mormon as "a big-budget saga, with special effects, and white actors in skin bronzer ... [and the] cutest Jesus you ever saw [who] comes down from the sky on a shaft of light and lands on a quasi-Mayan pyramid." Still, the writer was largely complimentary about the LDS element. "The subtle approach, in the end, was a brilliant move by the church," he wrote at the time. "The only religious shenanigans and Bible-thumping at the Winter Games came courtesy of angry other denominations, whose members circled Temple Square with anti-Mormon signs and pamphlets and posters." Everyone "looked nutty except the Mormons, who looked golden," Stuever wrote. "Underneath, the Molympics rang true and warm." To Thomson, that positive perception was partly due to the extraordinary volunteers  25,000 recruited by the Salt Lake Organizing Committee and 5,000 assembled by the LDS Church to work at the church's sites, including its own media center at the Joseph Smith Memorial Building. In a way, the many LDS volunteers became the face of the faith to outsiders. They were in-person precursors of the current "I'm a Mormon" ad campaign. They interacted one on one with reporters, athletes and visitors, telling their stories without preaching, showing their humanity and normalcy. "The Salt Lake Games were better than the Turin Games by a lot and better than the Athens Games," Thomson says. "And the difference was the volunteers. [Utah's] were amazing." A lasting legacy? • As Hinckley and members of his family watched the final Olympic fireworks light up the sky over the Salt Lake Valley, writes Romney in Turnaround, his book about the Games, tears ran down the Mormon prophet's cheeks. "Over one and a half centuries before, his predecessor Brigham Young and thousands of weary, impoverished travelers entered this same valley," the GOP presidential contender writes. "Now, their descendants and neighbors had welcomed the world to their mountain home. President [Brigham] Young had said that one day the flags of the world would come to Salt Lake; indeed they had." It seemed a capstone to Hinckley's lifetime of work toward improving his church's image. "I have to believe," Thomson says, "the church learned a lesson." The 2002 Games, she says, introduced Mormons to the world and allowed them to say, "This is who we are." But it also introduced the world to Mormons, particularly in the church's leadership and public-affairs arm. That has allowed Latter-day Saints to react better to satires such as the "Book of Mormon" musical, several journalists say, and to questions about Mormonism, attacks on it as a non-Christian cult and the fear of Romney being controlled by the church. The Olympics were a "great warm-up act," Thomson says, "for everything that's followed." Mormons showed they could laugh at themselves, Stuever adds, and that they didn't have to respond defensively to every story. "They realized that there are many responses to the Mormon faith and that you should roll with all of them," he says. "That kind of sophistication is directly traceable to the Salt Lake Olympics." In the end, the wildly successful 2002 Games, Shipps writes, largely exploded LDS stereotypes. "Shattered were the images of Mormonism as a peculiar faith tradition ensconced in the Intermountain region of the American West," she writes, "and of members of The Church of Jesus Christ of Latter-day Saints as spooky clean-cut zealots whose main goal is making converts." Unfortunately, Shipps says, all the Mormon stereotypes and controversies came rolling back with the next two Mormon moments  Romney's White House run in 2007-08 and his current campaign. The 2002 Olympic Games were uplifting expressions of unity, hope and inclusion, she says. Political contests, by their nature, are not. The Mormon Tabernacle reminded me of so many other good places I have been, places where people share their faith, and try to find some way better than the hurly-burly of the world. For me, in sporting terms, this was like going to Yankee Stadium and meeting solid citizens like Jeter and Rivera and Williams in the clubhouse, knowing it is as awesome up close as it is from a distance. No disillusionment. No bad vibes." There were images of Mormons taking over the flavor of the Games, of church members spreading their beliefs on every street corner. But on the bustling sidewalks of this wide-avenued city, as throngs of parka-wearing sports fans from around the country and world make their way to events, restaurants and shops, there is very little in-your-face religion. Many say the Mormons have been gracious hosts and these Olympics have been a chance for a little more understanding." The Mormon church kept its pledge to keep missionaries from spreading the word among Olympic visitors. In return it got a public relations bonanza from journalists who found a church that didn't seem as weird as they had believed."